Now that you’ve finished your 1911, it’s time to make it pretty! I went with GunKote since it is oven cured. Disclaimer still. I basically followed what I read in this thread. I ended up doing it twice, first without sandblasting and the second time with sandblasting. My preference is with sandblasting since it turned out to be a lot easier to do than I thought and with a much better end result. My first time with just cleaning and K-Phos led to some premature wearing on some parts. Went through and took apart everything down to just the bare slide and receiver. You should be a pro at this after building it up yourself. I then took it outside, put on my eye and breathing protection, along with some latex gloves, and blasted it twice with brake cleaner. That stuff is nasty so be sure to do it in a well-ventilated area. You want to get rid of all the oil since GunKote will not adhere correctly even if there is only the oil from you fingers. I put the slide and receiver into the oven around 300 degrees for 15-30 minutes so any additional oil can seep out. I then blasted it two more times. I also bought K-Phos which is a pre-treatment for GunKote (I used green matte) since I didn’t have access to bead blasting. I just dipped a clean rag into it and rubbed all the surfaces. Then I let it sit for 10-15 minutes. You’ll want the slide and receiver a little warm (around 100 degrees) when you apply the actual GunKote. It was 100 degrees outside, but otherwise I would have popped it into the oven or used a heat gun. I then strung them up. I tested light coats on some cardboard first, and then just went for it. The thread mentions that if you pop it into the oven it will make the whole house smell, but that if you let it dry a little, the smell is significantly less. I left it outside for 3 hours and then strung it up in my oven. I also read that the higher the temperature the stronger and darker it gets. I ended up following a post where they went 375 degrees for 90 minutes. The smell was definitely not too bad with just letting the windows open. After the time was up, I just turned off the oven and let it return to room temperature. Put a light coat of oil on everything and put it back together. I had to work the thumb safety in a little as well as my rails because of the additional paint thickness. Not too shabby! 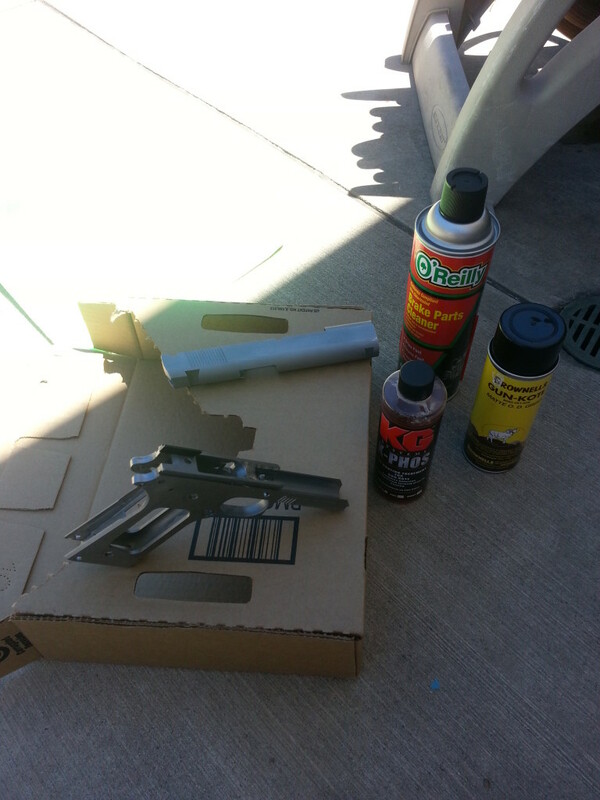 Take everything apart and clean as much as you can with just regular gun cleaning solution. 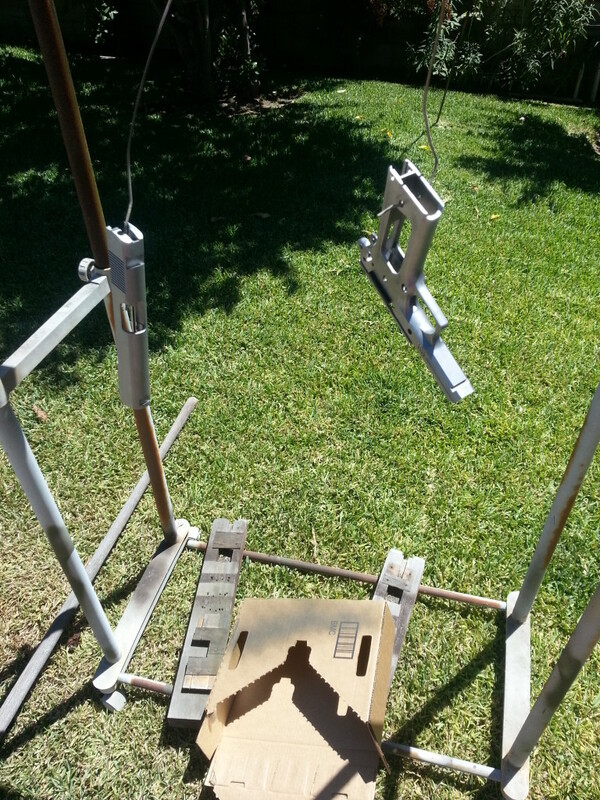 I bought a cheap sandblasting kit from Amazon for $20 which worked great. I also got some of the recommended 120 grit aluminum oxide off Ebay ($13 for 5 lbs). I found that 5 pounds was enough if I captured the leftovers once. If you just have virgin steel to blast, once through should be enough. I made my own sand blasting cabinet from an old sturdy box, some clear plastic sheet I found in the garage, and by cutting two holes for holding the parts and the nozzle. 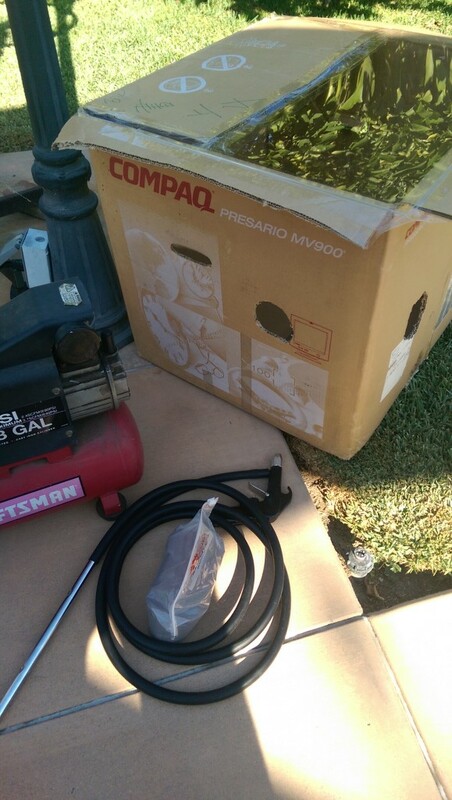 I borrowed a buddy’s air compressor which went up to 125 PSI with 1.5 BHP and 3 Gallon capacity. It worked great as long as I let it keep above 90 PSI. Here should be a good alternate from Amazon, or I’m sure good ole Harbor Freight will have some. Have good eye protection, a good mask/respirator for the small particles that will fly out, and thick gloves for your hands. I used a clamp for holding the parts when in the cabinet. The end product looked great. I went with sandblasting the beavertail and slide stop since I had some fitting work on them that exposed the bare metal. After, I used the same procedure as before. I just noticed the typos in my post dated 6/30/16! Is there a way to fix that? My eyes must have been high and to the right… The word was after “perhaps it” is a mistake on my part. The other mistake was painted. It should read “I applied two coats of paint as per the manufacture’s instructions”. Thanks again for the videos. I use them for reference often. Thanks so much for the tip, Matt! 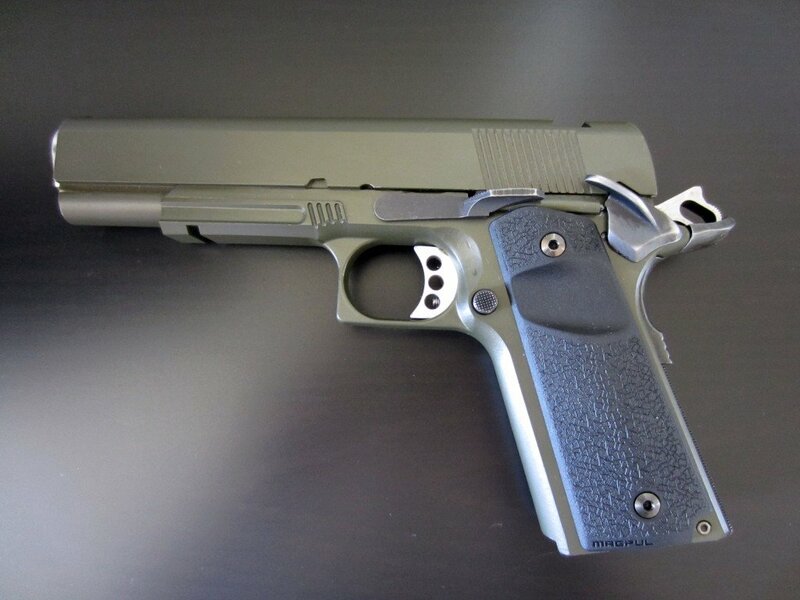 Hi Eric, very nice job on this DIY instructional 1911 build project. Because I’ve learned so much I’m considering starting this project myself. Can you explain what exactly is SSE and why the exemption enforced and now is gone from CA? Hi Carlos, good question. 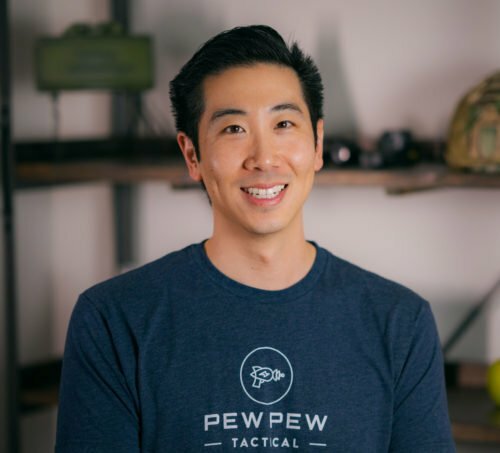 CA has a “Roster of Handguns Certified for Sale” and for a period you could get a gun that was off the roster as long as it met some criteria, the most well-known was to have a longer barrel and be “single-shot”. However, in 2015 AB 1964 passed which closed that route. I’m considering an 80% 1911, and I’m in California as well. How did you build it as a single-shot? Hi, when I built it in 2014, I borrowed a long barrel and single-shot magazine. Not sure what the rules are now for CA now that SSE (single shot exemption) is gone. Thank you for your reply. I’ve just picked up the hobby, and this seems like a great way to learn more about the build process. Great job! Great instructional HOW TO, Eric. 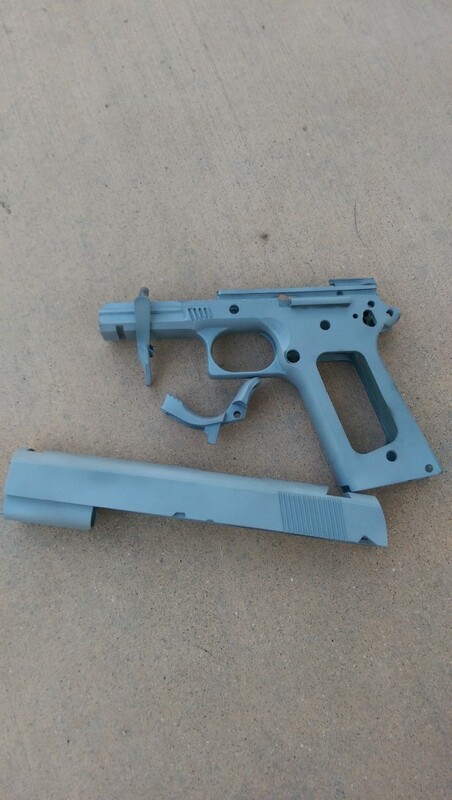 Maybe I missed it, but how much did you end up spending for parts alone in assembling this 1911? I realize you bought tools too that can (possibly) be used in another build, so how much did you spend on just the tools alone? Hi Mark, I just tallied up the tools (part 2 of my guide) and it comes out to be around $400 if you don’t have anything. 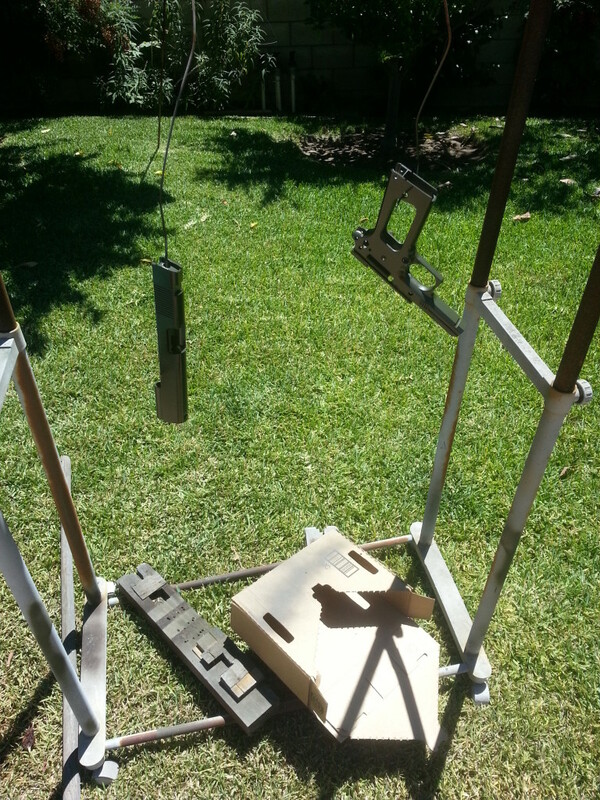 I had some stuff already like the drill press and a lot of the smaller items such as sandpaper, files, etc. 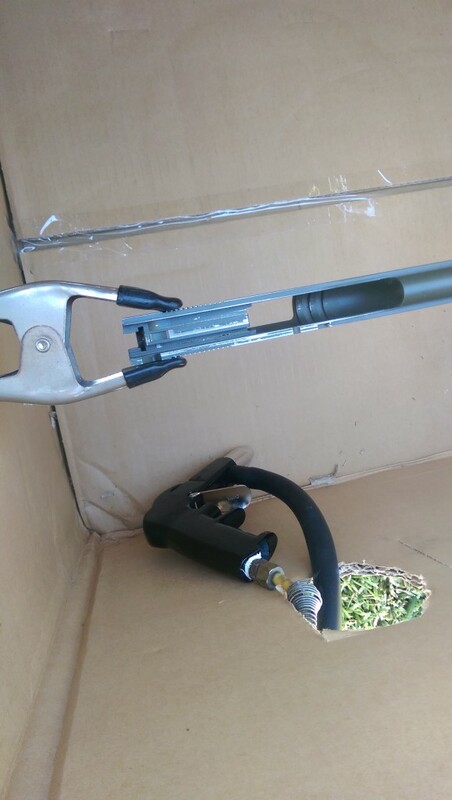 The nice to have tools is around $150 if you want to have an easier time installing and also to do a trigger job.